Hello everyone! I thought I’d do a post on all the books I’m reading this semester. Taking a German literature class and reading for fun occasionally intersect, especially once you realize that there are so many interesting German novels out there to read! Literally, Story of the Old Child. Ominous, isn’t it? This one I just finished last week. It’s 125 pages of fluid thought and disturbing images. A 14 year old is found on a busy street at night and sent to a children’s home for orphans. The twist? She’s actually a 30 year old woman pretending to be a child. It’s so creepy and the imagery is disturbing but in retrospect, the parallels with the GDR and opinions about it, whether positive or negative, are so well and seamlessly done that it takes a second read to realize it can be interpreted that way. Go Erpenbeck! Literally, Ms. Else, though Fräulein isn’t used to address an unmarried woman anymore, replaced by the simple (and more respectful, in my opinion) Frau. So: Else needs money for her poor dad. She’s gotta ask some creepy old guy for it. It’s probably not going to go well. This is for later in the semester, but I’m excited to read it. The author, Arthur Schnitzler, is Austrian as opposed to the more modern, German author Erpenbeck. Any stylistic/diction differences should be interesting! This one is also probably going to scar me. Literally, Poor Henry. Yay, medieval text! However, the version we have for class has the medieval German on one page, then the modern German translation on the next page. So, different versions of German text within German text: German-ception (Inception joke for those of you who are wondering). What’s this one about? Well, Heinrich needs a virgin to sacrifice herself or else he’ll die. And the 14 year old virgin sacrifice thinks it’s her destiny to die for him. Apparently, before she has her heart ripped out, he has a moment of: Oh wait. Maybe this is … wrong? No kidding, buddy. I have a feeling I may also be scarred by this one. That’s it in the MUST READ section for German. My Russian course is at a beginner level so I’m still learning parts of speech and the alphabet. I don’t think I’m up to par for reading Russian literature – I mean, have you seen some of it? I’ve read Crime and Punishment by Fyodor Dostoevsky but I don’t think I can imagine reading it in it’s original Russian quite yet. Call Me By Your Name by André Aciman – A Italian-Jewish teen falls for the man staying at his parents’ villa over the summer. The story follows the time they spend together and apart. Because I’m a terrible person, I read the last paragraph of the novel and saw that the title is the last line of the book and started to cry because I could tell it was going to break my heart into pieces. If you’re looking into GLBTQ fiction, I recommend this one. A film is coming out in 2017 with Armie Hammer (The Social Network, The Lone Ranger, The Man From U.N.K.L.E., and Mirror Mirror) and Timothée Chalamet (Men, Women, & Children and Interstellar). Super creepy Lovecraftian classics. If you’re looking for entertaining tales with endings that hook you and then leave you with the most unsettling of feelings, this is for you. There are some films made, but most of them are terrible. HOWEVER, if you’re interested in GERMAN, there is an amazing version of The Color Out of Space done in German called Die Farbe (just The Color). The title is appropriate as the whole film is done in black and white except for the mysterious color wreaking havoc. I just recommend that you stop the film right after the protagonist realizes what happened to his father. The ending got changed from the original one and it’s confusing and not good at all. Besides that, it’s an amazingly done German film! If you don’t love yourself, or just want a laugh, watch the 2001 film Dagon, done after the story The Shadow Over Insmouth and not Dagon, both by Lovecraft. Interest Rating: 5/5, Reading Difficulty: 2/5 for some odd 20th century vocabulary and vernacular, Creepiness Rating: 5/5 since that’s the whole point! Status: Mostly done reading. It is an anthology, after all. Anyone else love Arthuriana and Arthurian mythos? Because I definitely do (that half-edited novel-esque thing sitting in my documents that I work on every few days is a testament to that). This is, yet another, retelling of the King Arthur tale, taking a more historic approach. I took an Arthurian Lit. course my 2nd semester as a first year and yes, there is a historical version of Arthur that the myths may be based upon. Regardless, I saw it in a small second hand book shop at the end of Market Street in St. Andrews and picked it up with greedy hands. I’ve read and watched so many versions, even written my own, and it doesn’t matter; I will forever be captivated by this story and everything it could be interpreted as. 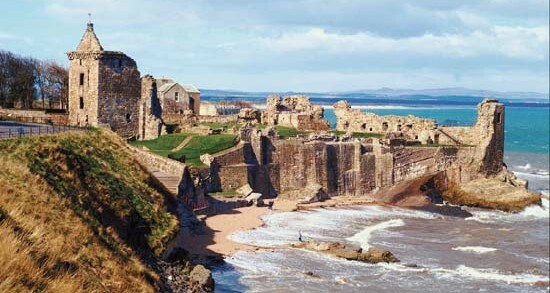 I’m also a historical buff (something St. Andrews is amazing for) and this historical take is bound to be interesting! Alright! That’s it. Thanks for tuning in this week at my Leseratte Ecke (Bookworm Corner/Nook) for class books and for fun books. Maybe some history next week! This entry was posted in books, St. Andrews, Uncategorized and tagged arthurian myth, arthuriana, books, film, german, reading, scottish on September 26, 2016 by borgesml.